PC has its own exclusives and a number of games release on consoles and PC. I haven't noticed consoles having a wealth of games not on PC. In fact, it's known that you get the best graphics on PC. If only HDR FALD came out 3 years earlier so we could get lower prices, ray tracing would make dark environments look spectacular, like in the timestamp above. People that have high contrast monitors (VA panels, HDR 384 dot panels) will have awesome dark spaces. lossofmercy wrote: I am just pointing out that for most developers, consoles is a huge market that they will mostly design their game around. And for a modern game with demanding aesthetics (IE, high production value), it is the reason they can even exist in the first place. As a former AAA dev, I see some truth in this but it's incomplete. There is a significant market place for High End PC gamers, who demand higher framerates and better image quality than console gamers, and deserve some tangible benefits for the money they invest in their rigs. Ubisoft recently said 21% of their sales is from PC, right around Xbox One. A couple years ago I remember PC was second only to PS4. What's annoying to a lot of PC gamers is the lowest-common denominator mentality, which, yes, is present in gaming studios but not universal. Many large companies have jumped on RTX and it's a competitive advantage that will be hard to ignore. Anyway, it's already integrated in Unreal and Unity, so it's not like most studios can't easily get it. Unreal is open source, so a competent programmer (or a team of programmers) could literally reimplement it a bespoke engine in a week, tops. Even if high end PC users account for 80,000 units sold of a mega blockbuster title, that's still millions of dollars that they're not catering to if they don't offer something extra. It's short-sighted not to, even fiscally irresponsible. Good point about ray tracing + physically based rendering + HDR being a natural fit with each other. Even a single bounce of indirect light makes a huge difference to most scenes and brings the realism way up. Plus ray tracing can do caustics and lens and atmospheric effects much better. There's tons of research going on right now in how to efficiently render smoke / mist and murky water or crystals using monte-carlo ray tracing and then AI denoising after. I love HDR and wish OLED screens inside VR helmets would get it too, including wider colour gamut, for this reason. There are several mobile phone OLEDs and LCDs now with HDR10 and P3 gamut, so it's only a matter of time I think. Sidebar: To do HDR in a VR helmet is actually easier than on a normal phone, because you have complete control over all the light that hits your eyes so you don't need as high peak brightness to due to our eyes adapting to lower APL inside the headset. I remember talking to John Carmack about it a while back on Twitter, I came up with an encoding scheme to exploit the low-persistence of the OLED rolling scan in the Oculus Rift to achieve 10-bit colour from an otherwise 8-bit panel, via pulse width modulation. (If you can modulate the intensity of each pixel in 8-bit gamma increments, then also modulate the width of the rolling scan pulses, you can get more effective bit depth than "single" modulation). He told me they already tried it but found that 9-bit floating point swap chains was good enough since most of the issues are in the darkest regions, where floating point offers extra precision over gamma-encoded integers. With the advent of high refresh rate and 10-bit mobile phone screens, this matters less, but there is still some banding in HDR10 which is PQ-encoded 10-bits, over 10-bit gamma 2.2 which virtually all displays are (except DLPs which are linear). So even a 12-bit panel using gamma 2.2 isn't as good as 12-bit PQ, which is the point beyond which there is no banding in HDR content. As you can tell, I don't care all that much for 2D games on a screen any more. I've played thousands in my life and the thrill is gone. VR, though, that's exciting and a good reason to upgrade to these. Even a crappy game in VR holds my attention longer. And what would a game designed for PC look like? Amazing graphics, runs like complete crap on a 970 or 1060, the cards most people have? You know, I don't think anything would change if consoles didn't exist. Only the UI and controls would be better. 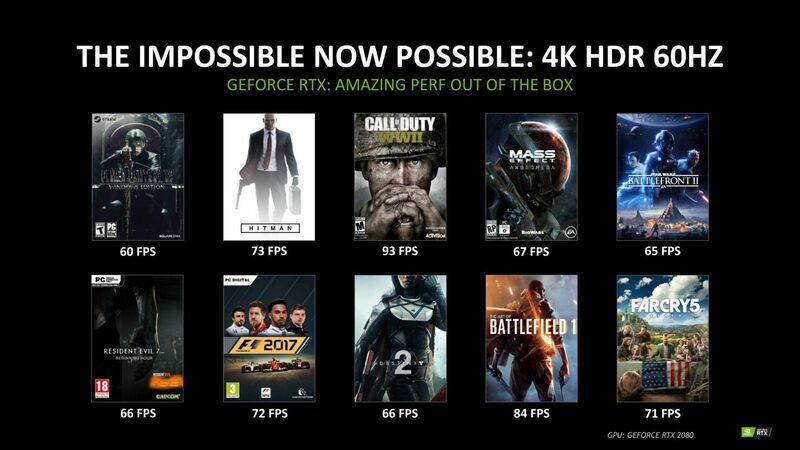 The graphics would be pretty much the same, because games need to run on hardware people actually own, not just $1000 GPUs. BattleAxeVR wrote: As a former AAA dev, I see some truth in this but it's incomplete. There is a significant market place for High End PC gamers, who demand higher framerates and better image quality than console gamers, and deserve some tangible benefits for the money they invest in their rigs. RTX doesn't seem to deliver. It hits framerates hard. When I can't maintain high FPS in a game, shadows, screen space reflections and ambient occlusion are the first things I throw out. They don't matter in the least to me, if the game runs like complete crap. I really don't care much about how a game looks. The most important thing is how a game plays. And with a lower frame rate, many games don't play well. Jensen Huang can say "wow" all he wants, but when it comes down to it, if enabling RTX in a game cuts its frame rate in half, it is completely useless to me. The big indication that ray tracing is falling short is the lack of an impressive water demo. And it all makes sense. Given the ammount of screen real estate that water can take up and the requirement for multiple traces per pixel and the fact that ai denoising can only go so far; I really dont think anyone expected amazing looking water effects even if the cards had 50x the ray tracing performance. But ray tracing has been the clear holy grail for water since advanced water rendering techniques were first developed. You simply cant do a second rendering of the scene because you need so many reflection positions and angles it will never work out. So withOUT raytracing you are left with either flat reflections (see wows highest water setting implementation) or objects being reflected in ways that the eye and brain can clearly tell are imposssible. RealNC wrote: I really don't care much about how a game looks. The most important thing is how a game plays. And with a lower frame rate, many games don't play well. The bolded part is fine, but it's just one preference, yours. I love high FPS too, who doesn't. The question is "what would you pay for in FPS to get something that looks real". So don't use it if you don't like the tradeoff. I'd personally say it depends on what type of game it is. A competitive shooter will have players running with barely any textures at low res. I mean, CounterStrike and more recently PubG are all very basic-looking for a reason. Lots of people prefer higher quality with lower FPS, actually I would say the majority do. There's a point below which most consider things "unplayable" on PC which is often 60 fps, but these early implementations will improve. Ray tracing optimizations are being iterated on every day, to reduce the number of rays cast per pixel while still getting the same (or better) image quality. In the past year alone I've read more peer-reviewed papers that show a 2-10x speed improvement in various ray-tracing related algorithms on the same hardware (e.g. photon mapping). The beauty of RTX and machine learning combined is that things will surely improve a great deal. Imagine comparing an early Geforce driver and then waiting several years to update it. You'll see a massive FPS boost most likely. The same thing is going to happen with ray tracing, except many of those optimisations will be done inside the engine, not the driver. But those are being added to Unreal and Unity all the time, with help from NVidia and Microsoft engineers. I've literally read on various forums all of these various "points" repeated ad nauseum. It's almost not even worth correcting them, because the industry is moving hard into ray tracing, even with consoles five years behind. They always were, and always will be. But hybrid rasterization + ray tracing games will get to the point of hitting minimum 60 fps at 4K (using various temporal upscalers and other tricks) sooner rather than later, mark my words. Reducing the number of rays cast below 1 spp is certainly possible through frequency analysis of the frame. So you cast more rays where it counts. And there are other "super secret" solutions coming down the pike that will also greatly amplify framerates even with full global illumination ray tracing activated. Trust me, this is a huge deal. The image quality boost from GI is something we haven't seen in ages. It's far more important than HDR and that alone was a big leap in visual fidelity on its own. I agree that for some games image quality takes a back seat to gameplay but above 60hz, trust me, most people do not care. Sites like this one with high framerate nuts like us aren't representative of the norm. All I'm saying is, you're free to use these new technologies, or not, as you wish. I don't see Skyrim benefitting much from running ultra-high FPS except in VR mode, for instance. Many adventure games are slower paced. But of course, eventually, you'll be able to get both ray tracing for indirect light and shadows and reflections without going below 60 fps much, if at all. It's really a new golden age of rendering coming on now. 4k at 60 fps with ray tracing is fine. What's not fine is being way short of it with these cards and marketing them for ray tracing. It appears the 2080 and 2080 ti will be fine for 4k at 60 fps obviously without ray tracing, but here the expectation or hope was higher as well. Let's see where the 2080 ti ends up being. Now, if this is average fps at ultra settings with a 2080 perhaps the ti will be satisfactory for smoother high quality gameplay to. Anyone know when the cards will be openly benchmarked?